It is apparent in local markets, pumpkin themed food and spooky decorations are making their way back to the shelves. Communities are preparing for the best holiday of the year and we at Sigma Pi are doing the same. 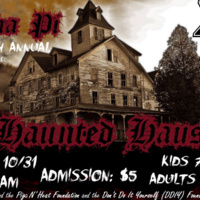 As we approach our 29th Halloween event we are beginning to plan and set up for our charity Haunted Haus! Sigma Pi: Zeta Epsilon chapter of Michigan Tech is opening donations to bring back another amazing charity event for the Houghton area. Donations are much appreciated and will be put toward the Pigs N' Heat Foundation and the Don't Do it Yourself (DDIY) Foundation. If you would like to donate please go to this link. Thank You, and have a (early) Happy Halloween!